Matt Smith, Tom Baker or that one in Downton Abbey? Doctor Who @ 50 As befits a show about a Time Lord, Doctor Who straddles the generations like a colossus. Even if you weren’t there in 1963, you picked up on the Doctor as some point during his travels. That means a shared experience, regardless of whether you grew up under the influence of Harold Wilson or Maggie Thatcher, whether you watched in Surrey Quays, London, or Surrey Hills, Sydney. Say the word ‘Dalek’ to one or more Who watchers and let the debate begin over who hid and where, the self-defeating nature of the rollers, and how a sink plunger may or may not have been the best choice of manipulatory instrument. And, of course, nothing was as tear-jerking as that regeneration - the best bits of which have been compiled - where else? - on YouTube. So The Reg decided to see just what Doctor Who really means to folk from a bit more than seven years of age to almost 70. We asked them to pick their favourite Doctor, ranging from the recent right back to the first. We conducted a longitudinal, if shallow, anthropological study across the years by seeking out people of all ages and from every decade of the Who canon to understand their encounters with the Time Lord, why - or if, in some cases - the show got them hooked, and which actors made the biggest impact. Some of those we chatted to asked not to be named, partly because their Who knowledge is embarrassingly paltry. Others asked to remain anonymous because their knowledge of the series is embarrassingly high. Nell is a bright third-grader whose rotten older brother got the Who bug and dragged her along for the ride. Matt Smith was Nell’s first Doctor and even though she’s seen some David Tenant, Smith’s the Who for her. It’s hard to get a nine-year-old to offer a detailed opinion, and Nell’s reasons don’t go much beyond “he’s funny”. Pressed, she will say she thinks The Flesh – from The Rebel Flesh/The Almost People – is her favourite villain and is pretty sure she understands how the Doctor got into that space suit in the lake, and which Amy did what and when. Daleks, she says, aren’t scary at all. Not one bit. Patrick came to Doctor Who in the David Tennant years, missing even Christopher Ecclestone, and feels the former can’t be surpassed. The teen hasn’t explored the Who archive and doesn’t intend to. He fears black and white episodes will be too naff as perhaps “the Daleks won’t be as well made”. That’s an observation that tempts damning commentary of a generation’s imaginative capacity, but the teen redeems himself by hoping for more Who stories set in the far future. Clearly recent emphases on Victoriana aren’t enthralling the iGeneration. The good news? Patrick still watches Who, as the show retains sufficient cachet to make viewing possible among his peer group. Miss 24, one of the sales folks at Vulture South, is too young to have had a chance to watch much Who before its 2005 return, but too old to have cared when Christopher Ecclestone revived the character. Dimly aware that Who remains on air, she named Matt Smith when pressed and was aware he had recent predecessors. That’s obviously no use for this article, so we also asked a Miss 27 and a Miss 29 to name their favourite Doctors and got more or less the same reactions. Let’s examine the space-time continuum and contemplate why this attitude is on show among twentysomethings. By the time of the Ecclestone revival, our twentysomethings had emerged from childhoods in which the Doctor was a mere rumour. Miss 24, for example, would have gone from the ages of 7 to 16 without any new Who on air. Those are formative years, leading us to wonder if Who’s interregnum might have created some kind of wormhole in space-time during which today’s twentysomethings were never of an age to either receive Who as an imparted parental taste or discover it for themselves. That our interviewees were not British may have ‘helped’ their ignorance by making it less likely they would encounter Who during the years it was off the air. 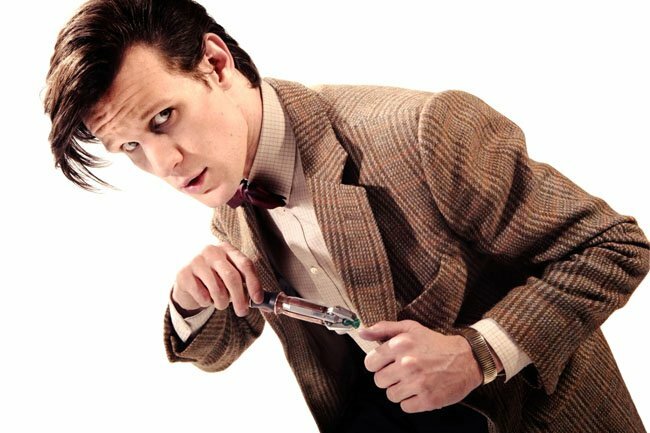 Don't get us wrong: Australia is a decent, Who-loving nation, but not to the same extent as in the Doctor’s most-visited terrestrial territory of the UK. US kids apparently talking like Peppa Pig... How about US lawmakers watching Doctor Who? Poll Decisions, decisions. Lucky number 13?